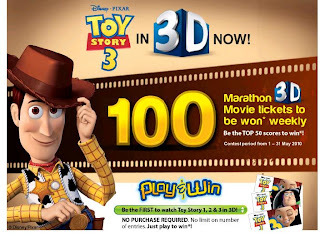 I WON 10 TICKETS TO TOY STORY MARATHON!! 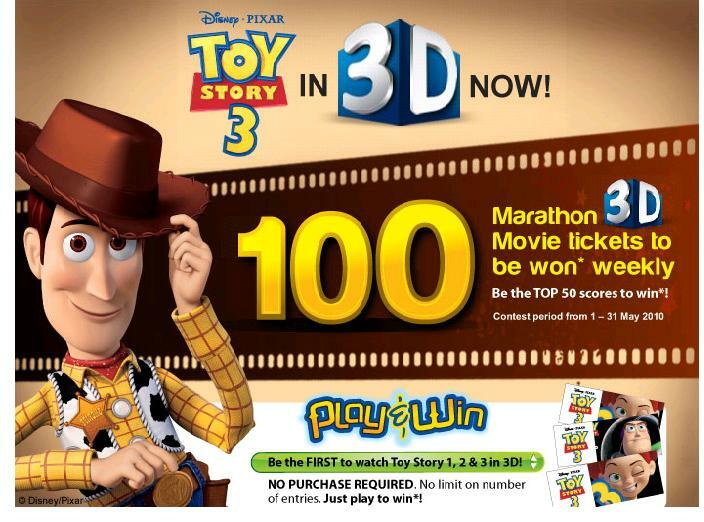 I WON 10 3D TICKETS FOR THE TOY STORY 1, 2 & 3 MARATHON TICKETS!! Why I said I won 10 tickets? coz ALL 5 NAMES was actually played by me..hehehe..Guess I'm really skilled in this game eh..Bak kata UNCLE, mmg budak bertuah!! My fren: 2498 --. last minit. I played from 11:45pm on Sunday. menang jugak.. Myself, my bro, my sis, my cik abang & his fren. so 5 people x 2 tickets = 10 tickets!!! For my family got 7 tickets-so this week I'm going to "play" for my other siblings to get more tickets.. I dont know why most of the winners are Chinese-didn't the Malays aware of this wonderful contest? serius tak tahu. main ape nih? haha! you are so lucky! should have so skillful for this game! baboon: i have a bigggg family..
My Sweetheart Smells Like Action3 CONTROL! SEOQUAKE: I KNOW YOUR BLOG'S PR & ALEXA RANK! Patung UPIN & IPIN di Bali, Indonesia!! I WANNA WATCH TOY STORY 3!! MY ALEXA RANKING -UP AND UP!! FREE PRINCE OF PERSIA TICKET! CAUGHT IN THE MIDDLE PREVIEW--SYIOK!! Victoria Secret Island Passion Edition!! Cuba Teka:Apa Dalam Baju? ehh,apa dlm bungkus..
Sape Pelakon ADAMAYA yang minum Tiger? Jumpa Adam & Maya!! LISA SURIHANI so cute.. SORRY PDRM, Tersilap Sapu!! -Pic Included!